Joseph is a compassionate Chiropractor dedicated to helping people of all ages and walks of life achieve optimal physical health and therefore enhance their quality of life. He trained at the Anglo European College of Chiropractic in Bournemouth, where he was awarded a Masters of Chiropractic with Distinction. Prior to that he completed a degree in Biology at the University of Sheffield and has worked as a Technical Instructor with the Physiotherapy Service at the Royal Devon and Exeter Hospital. Joseph is a member of the Royal College of Chiropractors and the British Chiropractic Association and is registered with the General Chiropractic Council. He also practices at Sidmouth Chiropractic Centre. He is married to Rosanna, a GP in South Devon, and they have a young son. In his spare time Joseph enjoys the great outdoors whether it be running, cycling, or walking his energetic golden retriever Mollie. Having given up on a Pain Management regime with the NHS, mainly because of the lengthy intervals between consultations and treatments, I referred myself to Dr Arkle. I have struck an instant rapport with a confident practitioner who explores problems in a professional and sympathetic manner. 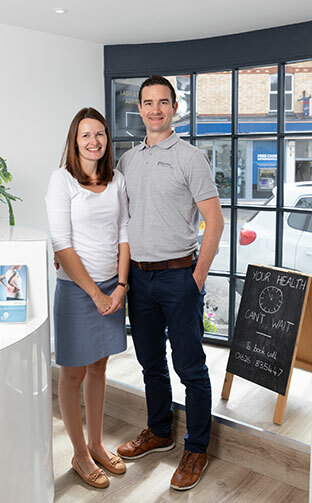 I have been, and am, receiving effective treatment to alleviate chronic back pain and mobility problems and have no hesitation in recommending the Bovey Tracey Chiropractic Clinic.